RIGHT NOW Trump and Kim meet at site of Singapore summit meeting. 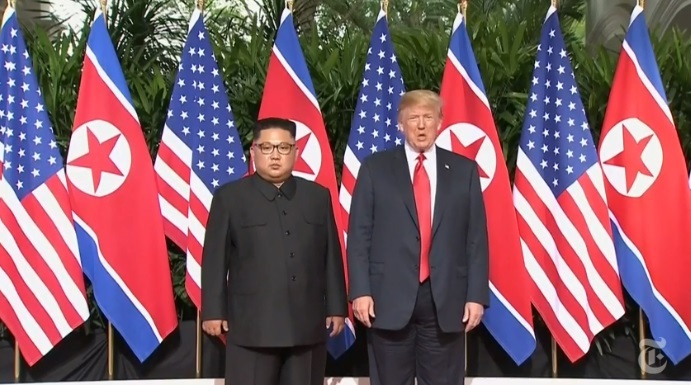 President Trump and Kim Jong-un of North Korea held the first-ever meeting between leaders of their two countries on Tuesday morning in Singapore, carrying with them hopes of ending seven decades of hostility and the threat of a nuclear confrontation. 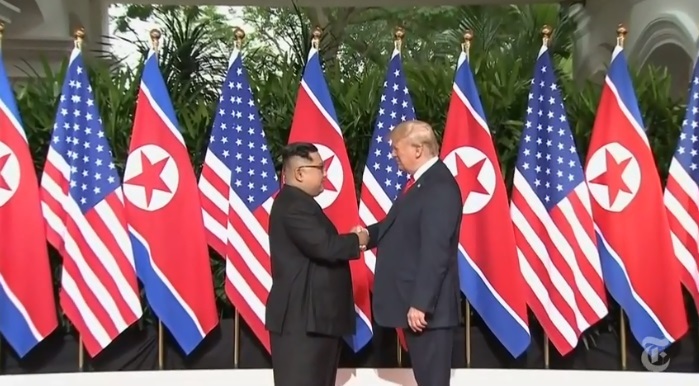 Shortly after 9 a.m., Mr. Trump and Mr. Kim walked toward each other and shook hands before the president put his hand on Mr. Kim’s shoulder before a bevy of cameras capturing the historic moment. They then went into a meeting with their interpreters. At stake in the meeting is the American goal of ridding North Korea of its nuclear arsenal, Mr. Kim’s desire to remove American weapons from the Korean Peninsula and to be recognized as a player on the world stage, and the international desire to ease the North’s provocations, poverty and extreme isolation. The talks could even open the way to an official end to the Korean War, which concluded in 1953 with a truce but never a peace treaty. South Korea will not be at the table, nor will China, the North’s most crucial backer. Mr. Trump arrived at the meeting at 8:14 a.m.